This isn't exactly the kind of cheerful update I'd like to share on my birthday, but life doesn't let us get to pick and choose bad news, nor did it let Albert Johnson b/k/a Prodigy get to choose whether or not to suffer from sickle-cell disease from the time he was born. Unfortunately a crisis brought on by that disease cost Prodigy his life in Las Vegas, where he was performing on the Art of Rap Tour alongside his Mobb Deep partner Havoc plus an all-star line-up including Ghostface Killah, Onyx, KRS-One and Ice-T. It appears at this time that Prodigy died at the hospital where he was being treated after suffering from dehydration and exhaustion at one of the tour events. Details are still in flux at this time. Prodigy seemed destined for a career in hip-hop from a young age, born into an extended musical family that included his mother Fatima Johnson, who was part of all girl group The Crystals in the 1960's (going by the name Francis Collins), and his grandfather Budd Johnson was an accomplished saxophone player, but his own father struggled with heroin addiction, and once left him sitting in the car while he robbed a jewelry store to support his habit. Prodigy overcame both his childhood ailments and his troubled family to become a successful recording artist alongside fellow Queensbridge Housing comrade Havoc (Kejuan Machita). Their first taste of mainstream success was a mention in the "Unsigned Hype" column of The Source, though at the time they went by the name Poetical Prophets. A name change to Mobb Deep preceded their first album "Juvenile Hell," which made some minor noise off the strength of the single "Peer Pressure." However it wasn't until a few years later when they got a little older and their voices dropped a little lower that their legacy was truly established on "The Infamous," an album now lyrically and musically regarded as an all-time East coast rap classic. "Shook Ones (Pt. II)" became an anthem. In a career spanning three decades, Mobb Deep would go on to release one platinum and three gold albums, with an estimated six million+ records sold combined. Prodigy also had a successful career as a solo artist, including the gold selling "H.N.I.C." in 2000. Unfortunately some of Prodigy's most potentially productive years were taken away after his arrest in October 2006 for illegal possession of a firearm, and subsequent plea agreement almost a year later, causing him to the next spend 3.5 years in prison. 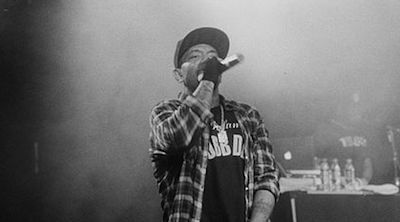 Prodigy wrote his autobiography while behind bars, and after a brief feud with Havoc, the two reconciled and returned to touring together as noted above. There are too many notable records Prodigy made, and too many aptly "infamous" moments in his life to list them all here, though many heads will recall Mobb Deep's participation in the East coast/West coast feud of the 90's, and the unforgettable diss from Tupac Shakur where he warned Prodigy that "one of you n---az got sickle cell or something (and) you f--k around with me and (you'll) catch a seizure or heart-attack" on the song "Hit 'Em Up. "Despite that dire prediction Prodigy had another two decades as a man and an artist before the grim reaper finally caught up to him. Our condolences to his family, his friends, and millions of fans worldwide. A statement from Prodigy's publicist: "It is with extreme sadness and disbelief that we confirm the death of our dear friend Albert Johnson, better known to millions of fans as Prodigy of legendary NY rap duo Mobb Deep. Prodigy was hospitalized a few days ago in Vegas after a Mobb Deep performance for complications caused by a sickle cell anemia crisis. As most of his fans know, Prodigy battled the disease since birth. The exact causes of death have yet to be determined. We would like to thank everyone for respecting the family's privacy at this time."